You are here: Home > Do vitamins cause cancer? The authors are commenting on a paper that appears in the same issue of JNCI that investigated whether folate supplementation decreased the risk of precancerous growths in the colon. Folate did not decrease the risk; it increased it by 67%. Further analysis revealed that folate supplementation increased the risk of prostate cancer by 167%. … Among studies addressing micronutrient supplementation for the prevention of cancer, only a single randomized trial, testing 1200 mg of calcium for preventing the recurrence of colorectal polyps, has reported a statistically significant and positive result for its primary cancer outcome, whereas large trials testing supplementation with multivitamins, folate, selenium, β-carotene, and vitamins E, C, D, B 6 , and B 12 have found no benefits. The scientific rationale for testing vitamin supplements for cancer prevention was sound. A variety of studies have shown that people who don’t have cancer have higher levels of certain micronutrients. Unfortunately, the assumption that these vitamins and minerals prevent cancer was unjustified. … the notion that some is good and therefore more is better has been proven wrong; it is more likely that for any given micronutrient, there is an optimal range of intake. That’s not surprising, considering how vitamins and minerals function within the body. Micronutrients are like nails in a house. Without enough nails to hold the various parts together, a house will fall apart. However, once the optimal number of nails has been reached, adding more will not increase the stability of the house and in large amounts, might even decrease stability. That explains why vitamin supplements fail to prevent cancer. How would supplements act to cause cancer? … using the folate supplementation trial as an example, it is not unreasonable to assume that optimal levels of folate are associated with more fidelity in DNA replication and thus a lower risk of spontaneous mutations, but high folate may also support more rapid cell growth and promote carcinogenesis in previously initiated cells. Another possibility is that large quantities of specific vitamins or minerals may be consumed by particular types of cancer. In that case, low levels of that vitamin or mineral in cancer patients reflect the fact that the cancer needs the micronutrient. The level has dropped not because high levels of the vitamin or mineral prevent cancer, but because the cancer has used up what is available. Far from preventing cancer, supplements might actually feed the cancer and promote rapid growth. … It is safe to conclude that cancer prevention is not going to be as simple as recommending high-dose micronutrient supplements for middle-aged and older adults. In fact, the opposite may turn out to be true. 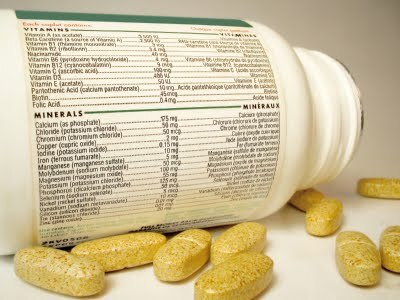 Vitamin and mineral supplements may promote cancer growth. ← Why is the Cesarean rate sky high?